Like many craftspeople I've had what's sometimes called a 'Portfolio career,' i.e. I've taken on part-time teaching, run workshops, licensed and sold my designs and illustrations to supplement my earnings as a craftsperson/maker. This year I decided to give my business a bit of an overhaul and improve the things I'm not very good at e.g. marketing, sales, branding, number crunching! and joined the Design Trust's 111 club in order to Dream, Plan, Do and the emphasis is very much on the do! As a 21st business birthday present, I decided to have some 1-2-1 sessions with Patricia Van den Akker who runs the Design Trust in the UK. As a result, I've worked hard and made some progress, I have a new website and shop (www.sampickard.co.uk), I have a clearer understanding of what my brand is (or will be), I know what motivates me and what I'm most passionate about, but I'm finding it difficult to fit it all in, and create new work and do all the fairs and cope with all the other things life has a habit of throwing at you! This is why my blog and drawing have taken a back seat as behind this silent exterior I'm working harder than ever. (I've also realised that I find marketing my work really difficult as my work is very much a part of who I am, and my creative self esteem is, even after 21 years in business, still easily dented). 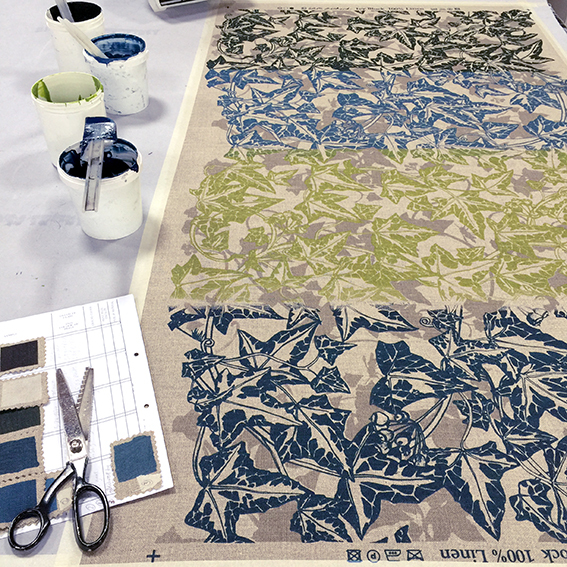 Of the many things I've achieved this year so far, the creative highlight was printing my own lengths of fabric. 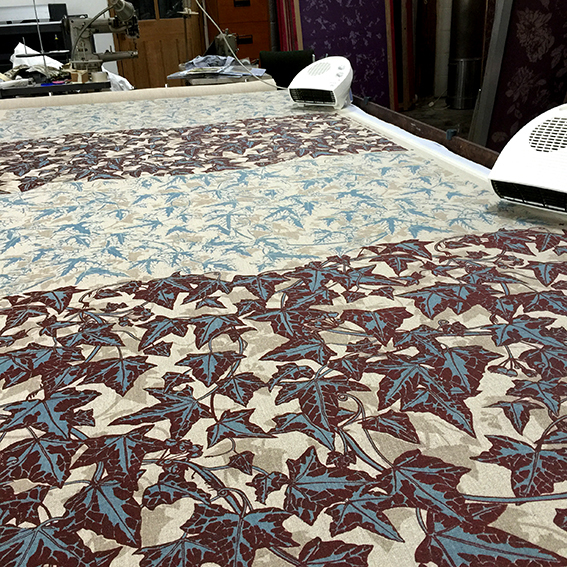 The Ivy Block I designed in 2014, as a block and screen repeat, but then sent it off to a manufacturer who printed it on a digital printer. 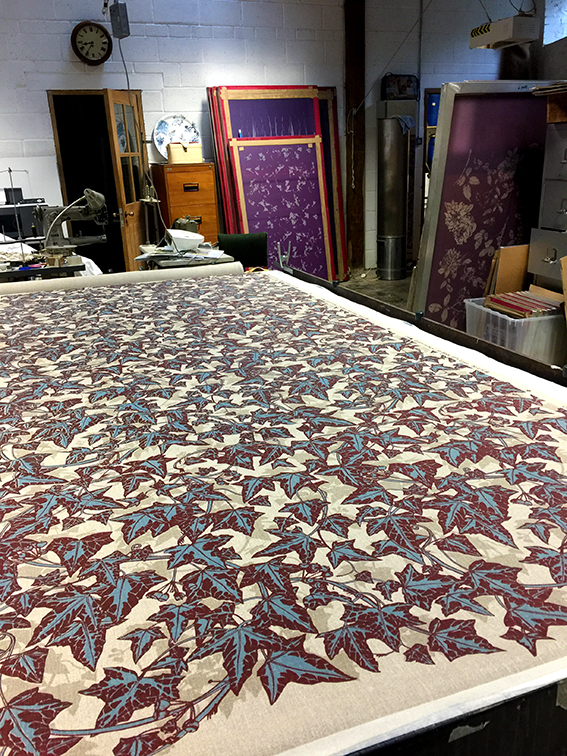 You might wonder what the difference is between a commercially/digitally printed length of fabric and a studio-printed length of fabric? In the end the difference is far beyond the look of the print, or it's commercial viability, it's the level of satisfaction of doing something you were trained for which in my case was thirty five years ago at Camberwell Art College, and although the big fabric manufacturers dominate the textile industry, I believe there is still a place however small, for fabric that's printed on an Arts and Crafts scale. 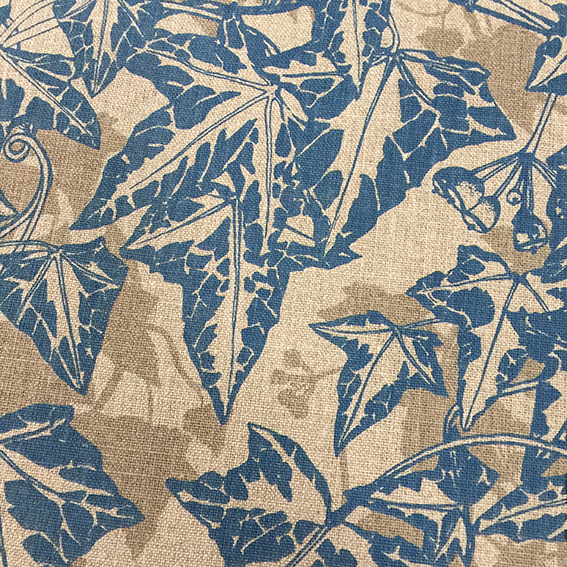 Here are the first images of the Ivy Block design being sampled and printed in my studio. 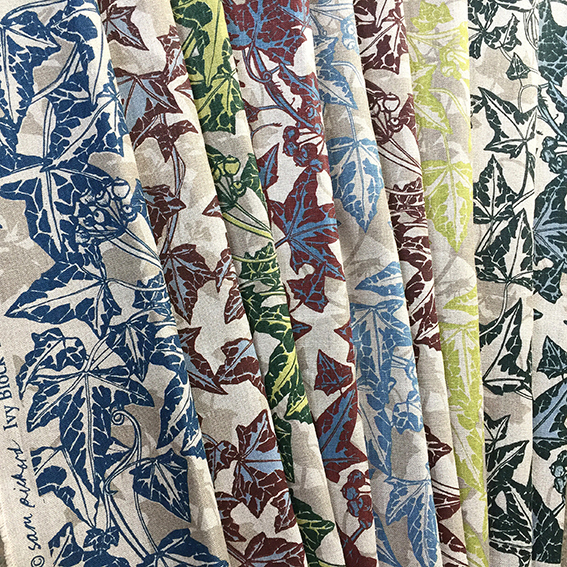 I'll be exhibiting these fabrics at West Dean Arts and Crafts Festival from 2nd-4th June and at The Contemporary Crafts Festival, Bovey Tracey 9th - 11th June. Well worth a visit if you can make either of them, and I'd love to talk you through the print process if you do. "Have nothing in your house that you do not know to be useful or believe to be beautiful"